MUSIC bar, The Wise Monkey, is extending an open invitation to customers to come and soak up the sun with a beer and a bite at its new al fresco terrace on Great Western Road in Glasgow’s West End. The popular outlet, which aims to provide customers with the best value fresh food available anywhere in town, has invested heavily in the creation of a top of the range outdoor eating and drinking space so that customers can spring into summer by making the most of the warmer weather. 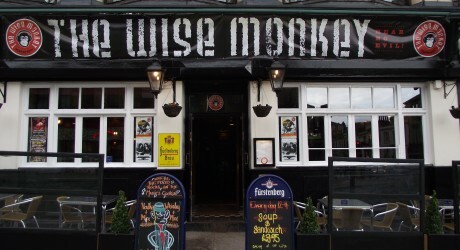 Manager, Graeme Hosie, said: “The Wise Monkey is very fortunate in that, on sunny days, our outside space on Great Western Road is bathed in sunshine from dawn till dusk – that makes it a very popular place to while away an afternoon people watching whilst enjoying a bite and a beer, or somewhere to hook up with friends after work or university. The Wise Monkey is all about the music and the great grub. A frozen food-free zone (right down to the hand-cut chips), it uses only the finest of fresh ingredients and all dishes are made to order from scratch. Offering great live music five nights a week, fab food and a broad selection of cask ales, premium lagers, malts and wines, The Wise Monkey, where the food rocks and the music’s cookin’, can be found at 508 Great Western Road (underneath Viper) in Glasgow’s West End.